"Kids love dirt. 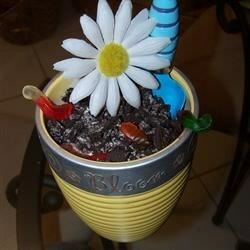 Can be made in a large flower pot or 2 small flower pots." Put the cookies in a food processor and process until they become fine crumbs.Set aside. In a large bowl, combine the butter or margarine, cream cheese, confectioners sugar and vanilla flavoring. Beat on low speed to mix then beat on medium speed until smooth. Add the chocolate pudding mix and milk to the bowl. Beat on low speed to combine. Fold the whipped topping into the pudding mixture with a rubber spatula. Assemble in the ungreased 9×13 inch pan in layers as follows:first layer, 1/3 cookie crumbs;second layer, 1/2 pudding mixture;third layer, 1/3 cookie crumbs;fifth layer, 1/3 cookie crumbs. Tuck the ends of gummy worms in the cookie "dirt". Be sure to have a worm on each piece. Store in the refrigerator. Chill for at least 3 hours before serving. Cut into 15 squares, or serve with a clean garden trowel or a toy sand shovel if serving in the flower pot.